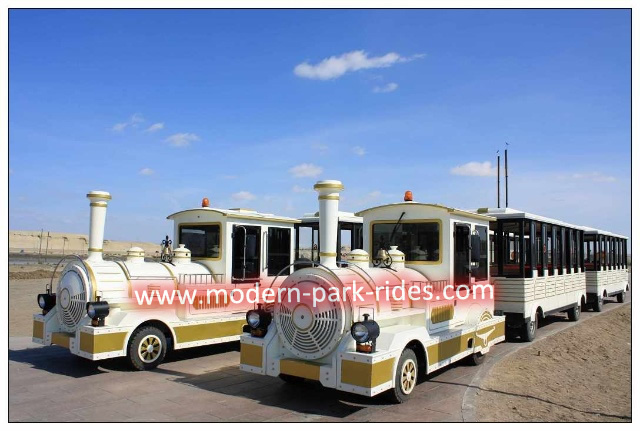 Zhengzhou Modern Amusement Equipment Co., Ltd. is the top amusement park train ride manufacturers in China and supplies various quality amusement equipment for customers all over the world, including the trackless train rides. And all quality amusement equipment in Modern amusement equipment sells well nationwide. Please leave your message here to know more information. 1. Various in colour, cute cartoon for carriage decorations and driving freely with music, which is attractive and can be customized by customers. 2. Safe in operation and high in quality with reasonable prices. 3. Decorated with LED lights for the carriage, the park trains is flashing romantic at night. 4. Powered by electric motor, the trackless train rides are eco-friendly. 5. It has novel shape, security, good performance to adapt to wide range of amusement parks. 6. Modern amusement park trains for sale have a longer service life.